Yes!! Finally, the truth comes out about, not about his unit, that Little Girl Parker fakes his fouls against him. It doesn't surprise me, he is a Spur. Im just waiting for Ginoboli's boyfriend to come out and declare the same crap on Manu, oh wait, we see it everytime he plays. Some of the players in this league should just take their Euro-trash basketball back to where they came from and let the real men play. Wow. There are so many mistakes on this post. Let's see. Brevin Knight "tossed out a couple of rebounds", whatever that means. Chris Kaman is that hideous "shot ejector". And of course "whatever Duncan caught must have been catching". And I'm not too sure of what to make of the previous sequence TD single-handedly kept the Spurs in the game last night, but somebody must have replaced his talcum powder with Vaseline. Because 7 turnovers (to 2 assists)?" 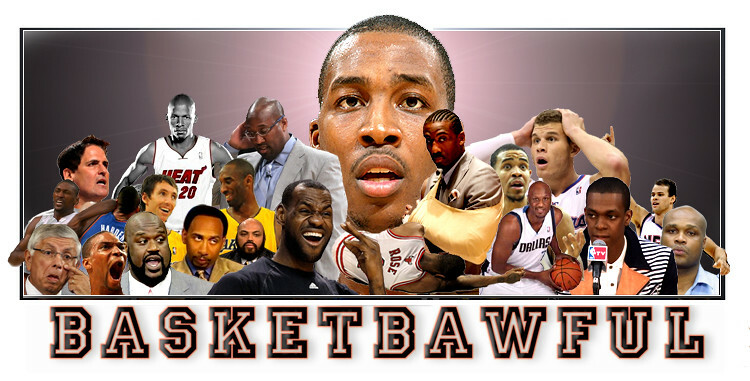 Bravo, Basketbawful. Sure glad to see that new Deadspin gig isn't killing your proofreading prowess. Maybe in your next "Worst of the night", you can say "Basketbawful: the dude seems to have lost all command of the English language. Look at yesterday's post (insert the above mistakes). There probably would have been fewer grammatical errors if he had outsourced the writing of that post to someone in India. Nice going with the proofreading." On a strong note: the post on Tim Thomas. Here' a Knicks fan what-if: what if we had never traded Keith Van Horn for Tim Thomas. That's right. I actually am regretting trading friggin' Keith Van Horn (Keith Van Horn!) for that dead weight. Wow. If there's one thing Eva knows, it's bad acting. Why didn't Eva just come out and admit she fakes it every night too. manic: Agreed, on all counts. anonymous: Thanks for your comment! I haven't gotten the chance to call someone an "idiot" lately, so this is a refreshing change of pace. Second: Chris Kaman is, in fact, hideous. If you can't see that, you don't have eyes. "Shot ejector" is just another way to say "shot blocker." Seriously, was it really that hard to figure out? Third: It gives me real, physical pain to have to explain this, but I was inferring that Duncan might have caught some form of turnover malady, and that malady must have been contagious, because all the Spurs were throwing the ball away. Have you ever "caught" a cold? Have you ever heard of something being "catching"? It's in the dictionary. Of the English language. Seriously, look it up. Fourth: "Because 7 turnovers (to 2 assists? That's kind of a lot." Have you ever heard of this amazing linguistic device known as a "rhetorical question"? And hold onto your brainpan, but that, too, was a rhetorical question. So sure, I was guilty of a typo and a few ideas that could have been explained more clearly. But "lost all command of the English language" is pretty hyperbolic, even for this site. But hey, it sounds like you're a Knicks fan, so I can't totally blame you for hating the world and everything in it. Hate is all you have left (at least until Isiah leaves, or dies). The inevitable arrival of the Hater. This has to be a natural event in any bloggers life, no? tonewise 1 -- Yeah. The thing is, I write at least one post every day of the work week. When you use the same terms over and over and over and over and over, you get kind of sick of it. So I try to throw in some new stuff here and there. Once upon a time those terms were not everyday terminology in ball. Damn Manu Ginobili. He's made Finley useless in my fantasy league again. When Manu was out nursing his flop wounds, Fin was playing like Dallas circa 04 (which isn't great, but hey, it's better than most others). tonewise: No worries, bro. I gotcha. A lot of this stuff is experimental, you know? I'm just trying new things. Kind of like when Dr. Frankenstein put the criminal brain in his monster. bob: Finley sure looked like he took a little trip in the WABAC machine for a couple weeks, didn't he? The thing about Fin is, he's not at his best as a roleplayer. He needs his shots, and he needs to be a vital cog in the offense. But when Manu's around, they don't run very many plays for Finley. He becomes, more or less, a spot up shooter. That's not his game, just like it wasn't Reggie Miller's game (and you'll note that Reggie morphed back into the "Old Reggie" when the Pacers had all those injuries and suspensions, and thus got more time). But yeah, it's Manu's fault. He makes the world a little bit darker for us all. Basketbawful: This is the idiot here. I hope you know I wrote in complete jest (specifically the second paragraph: complete hyperbole, which I guess was the point). I just wanted to point out that I detected more errors than usual in the post. I also forgot to add the part where I ask "and why am I criticizing a free blog?" But seriously, I read your blog everyday so keep up the good work. But the third paragraph is actually serious. I also have to add that I'm slightly less hateful now that Marbury isn't around to pull that prima donna crap while distracting and demoralizing the team. anonymous: I knew you were joshing me, but also slightly serious. And, although I mocked you -- it's what I do -- I did fix the "rebounds" typo and changed the wording of the Duncan item. Admittedly, the Deadspin gig is eating into my Basketbawful time, but even before, there were always some typos that slipped through the cracks. I usually post, go away, then come back and reread for errors. It's the hazard of still maintaining my Clark Kent job. I feel your pain, dude. Hey, lifelong Pacers fan, here! The thing is, I'm totally fine with my team not winning the title. Well, not totally. But I understand only one team can do it. I just want to see my team managed well, and I want to see the players work hard and play unselfishly. I would be happy with that. And I'm guessing you would be to. thanks for the daily post! I have to disagree with you on Brevin Knight. It's not the first time you diss him, and I think it's kind of unfair. He seems to be playing crap at LA - but he's been one of the most underrated point guards in the league for years. Knight used to have a fantastic A/T ratio, he's a great ball handler and he's a surprisingly capable defender for his size. He can't shoot, but hey, neither can Jason Kidd. 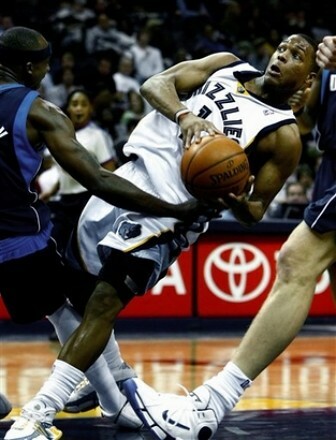 I watched quite a lot of his games when he was with the Bobcats, and the guy was solid. Sure, he was solid in crappy teams, but a very decent point guard still. Hmmm, I'm not saying the guy's an all star or anything; but he'd be a really good fit for a team that needs a point guard who can run things without having to score - he'd be a useful upgrade for teams like Cleveland or Boston. In summation: don't hate on Brevin. PS: Congratulations on the Deadspin gig. Richly deserved! quit knocking the spurs "manic". youre probably a mavericks fan. you can make fun of san antonio all you want. but ginobili and parker have more championships than you've had girlfriends.